Toronto is one of the most multicultural cities in the world, evidenced by the many cultures that have helped shape the city’s streets and neighborhoods, as well as the diverse culinary scene. 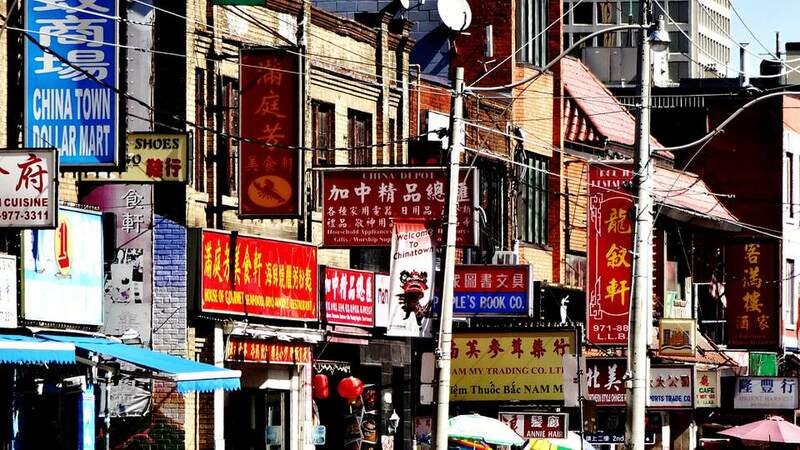 One of the most exciting neighborhoods to explore in Toronto is Chinatown. Walking through the array of shops, restaurants, food stalls, and bustling produce markets is a sensory experience that immerses visitors directly into the city’s Asian community. Whether you’re a first-time visitor to the city, or a Toronto native, Chinatown is worth exploring. Here’s everything you need to know about visiting Toronto’s Chinatown. Toronto’s Chinatown is one of the largest Chinatowns in North America, the history of which dates back all the way to the late 1870s, with the opening of the first Chinese business in Toronto (a laundry business). Between the late 1800s and early 1900s, many more Chinese-owned businesses opened up in a small enclave on Elizabeth Street, from Queen Street West, north to Dundas Street West. By the 1940s, the population in Toronto’s Chinatown grew to be the third largest after Victoria and Vancouver, British Columbia. The initial location, however, was not to last. Due to plans for a new Toronto City Hall right in the heart of Chinatown, a large percentage of inhabitants and business owners were forced to relocate to the current location. The Chinatown we know now continues to change but continues to be one of the city’s most interesting and colorful neighborhoods. Your best bet for getting to Chinatown is to do so via public transit so you don’t have to search for or pay for parking. Toronto Chinatown runs along Spadina Avenue between Sullivan Street and College Street and along Dundas Street West between Augusta and Beverley Streets. To get there, you can take the King streetcar (number 504) to Spadina and walk two blocks north. You can also take the Dundas streetcar (506) to Dundas and Spadina or take the subway to St. Patrick station and walk two blocks west to the heart of the action. The Spadina streetcar (510) runs right through Chinatown, between Spadina and Union stations. You can visit Chinatown all year round. The best way to enjoy Chinatown is simply to explore it on foot, popping into the many stores, herbal remedy shops, cafes, restaurants, and produce markets that line the area. In addition, the Chinatown area is also in close proximity to the always impressive Art Gallery of Ontario and eclectic Kensington Market. Also in the area, you’ll find Bau-Xi Gallery, one of Canada's top commercial art galleries featuring Canadian and international artists, and Art Square Gallery, which also houses a quaint café with an extensive menu. Although you can wander through Chinatown year-round, the warmer months are best for seeing the area at its liveliest and most colorful. Chinatown is a great place to find and stock up on Asian ingredients of all kinds, many of which can be hard to find elsewhere in the city. Toronto’s Chinatown can often feel very crowded, so when walking through it, be patient. You will likely have to walk slower than usual due to all of the people on the sidewalk, but use that as an opportunity to take it all in.